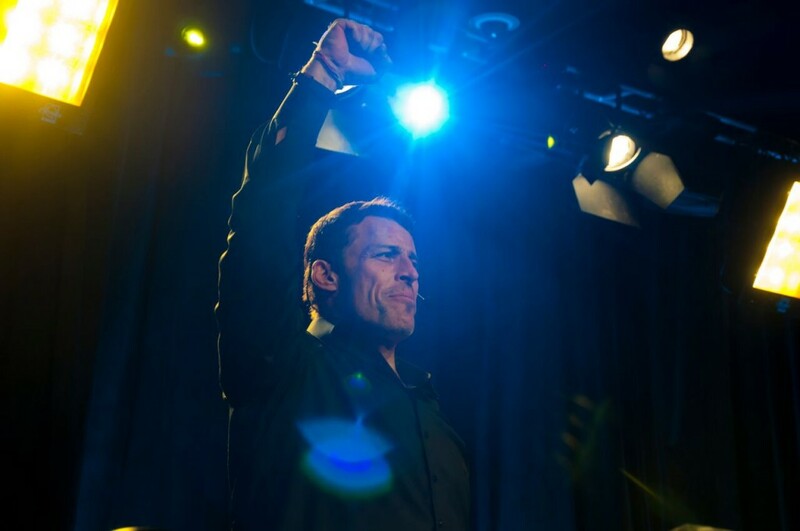 World-famous performance strategist, speaker and entrepreneur, Tony Robbins is a fast paced, high energy man who wants to change the whole world – starting with himself and moving onto you and you and you. He has worked with the likes of Bill Clinton and Serena Williams, has received numerous awards and a lot of press. In his Ted Talk, he introduces us to the most defining moment in his life. By the age of 17, Tony had enough money to fulfil one of his first goals, to feed two families for Christmas. The following year, he fed four families. After he fed eight families, he realised he’d need a little help and finally told people he was doing this and got others involved. Last year, Tony’s organisation fed millions. Many of us feel that in theory, one small gesture of kindness can can have a big impact but it’s special to see that so clearly manifested in one human. But it was also down to Tony’s state of mind and gratitude. It makes me wonder how many of those moments have there been in my life? Did I notice? What was their impact? And it reminds us of the very real value of our emotional well being. A defensive, negative, or hurt reaction could have painted a very different picture than the man we see today. In working to help people achieve the success or the happiness they want, Tony works in really practical, logical ways – well logic that fits to the sheer lack of logic that seems to motivate us! He says we’re motivated by emotion and gets people to do main things. Firstly, figure out what you want specifically. In relationships, in work, in health. Once you give your brain something clear and direct to focus on, it starts to navigate the path. It makes sense. When you want to walk to the shop, you walk that direction. You don’t walk whatever way you happen to be facing at the time and suddenly become surprised and disheartened by the fact that you’re at a dead end, nose pressed against a wall. Secondly, he wants you to understand why you want this and lists seven things that motivate us. 1. Certainty, we want to feel safe and secure. 2. Uncertainty, we get bored by too much of that and crave variety and change. 3. Significance, we want to feel important. 4. Connection and love. And the last two he says are spiritual, we want to grow, and we want to contribute beyond ourselves, to give back. With important motivating factors like ‘connection and love’ and ‘giving back’ listed in his lessons, Robbins is one of the many people changing corporate culture today. It seems that about a decade ago, the biggest motivating factor was make more money – or at least borrow more. But that mind set went hand in hand with a work culture where people prided themselves on working hard – in many cases, working too hard. To be the best and become the most successful, sleeping was not allowed, you probably didn’t make too much time for exercise and no one would have been surprised if you ate noodles in your office every night of the week for dinner. Meditation was for hippies – not something that was seen to optimise your life in general. Today, people like Robbins, Ariana Huffington and plenty more are instead pushing the idea of working smart, and creating a balanced life. It’s not fashionable to work yourself to the bone anymore. What’s cool and successful in 2015 is having time to spend with your family at the weekend and in the evenings, making time to eat healthily, having time to make your own beer. Getting eight hours sleep is so hot right now and so is taking time out for yourself. People like Robbins, who can see that money isn’t the only thing motivating us, are able to tap into these more balanced goals and help people to see how they achieve all of that – not just how to achieve fame, or wealth. Alongside these trends for more balanced living is also a tide of corporate social responsibility. Today, a company can’t really get away with not having some sort of programme or initiative in place that at the very least looks like it’s going to help create a better world. I like to play the sceptic when it comes to things like Zuckerberg ‘giving away’ 99% of his Facebook shares because I can’t help questioning everything, but when you look at Tony’s list of motivating factors, the trend for more balanced living and a growing awareness of the serious impacts of climate change, you actually can imagine that top level CEOs are as concerned as the rest of us. It’s as if the world’s problems have finally become close enough to each of us to feel the need to change for the better. And it’s not just us sensible, grown ups having a change of heart. The generation coming up behind us might be the ones really driving this shift. Millienials often get a hard time in the media, but according to Forbes, for 64 per cent of them, their priority when it comes to work, is making the world a better place. That’s a pretty honourable goal. 88 per cent prefer a collaborative work-culture rather than a competitive one. Perhaps they’ve seen how far competing within an organisation has gotten anyone. And if you think they’re dreaming and the world of big business isn’t ready to offer them this yet, it doesn’t matter, because 67 per cent of them would be very happy to start their own business, one that aligns to their values. Within this wave of corporate change and a very different generation stepping up to take the wheel, people like Tony Robbins gain further importance and relevance, because we haven’t all caught up with these new habits of balance that we aspire to, and many of us require direction and assistance in figuring that out still. For the twenty-somethings hoping to start their own business these types of teachers are important too, because as beautifully idealistic as they are, they may not fully understand the challenges they’re going to face in starting their own companies, the resolve and persistence they’re going to require and what innermost parts of their being is going to take them through it all. In his promotional video for his first ever talk in Dublin he says, “I’ve learned that there are patterns, patterns that cause us to succeed and patterns that cause us to fail. And there are patterns that we can put inside of ourselves that create a sense of abundance, and strength.” Maybe these patterns aren’t something we learned in school or university that are worth putting the time into, not only to shift our own lives forward, but if we can become as effective as he promises, these lessons could help us with everything from work-life balance, to climate change. If I learn nothing else from Tony, I will valuably incorporate these three lessons into my life. 1. Be grateful and notice what the universe does offer. 2. Write down the life I want. 3. Look at what my biggest motivating factors are, and let them become the energy to drive me there.